Today, the New York State Quarter Coin remembers March 29, 1848 when an ice dam on Lake Erie at Buffalo stopped the flow of water over the American side of the Niagara Falls. Some conception of the amount of ice floating in the Niagara River during the “break up” in the Great Lakes, may be had from the photographs annexed to this article. Within the last sixty years the American Falls have been practically dry three times, due to the diversion of water to the Canadian Falls by the formation of ice jams in the Niagara River. On March 29, 1848, an ice jam at the outlet of Lake Erie at Buffalo, held back the water for an entire day, so that the crest of the American Falls was dry. On March 29, 1903, cake ice became stranded on the shoals at the head of Goat Island and formed a jam that diverted all of the water to the Horseshoe Falls. On January, 1904, the same conditions occurred from an ice- jam. In connection with the following discussion, it should also be borne in mind that the discharge of Niagara River, and consequently the elevation of the water surface at the inlets to the canals, is greatly affected by the direction and force of the wind. A gale of wind blowing toward the head of Lake Erie will hold the water back so that the water level at Port Day is three or four feet below ordinary level; a heavy wind blowing toward the outlet of Lake Erie will raise the water level to an equal amount. The discharge of Niagara River is affected more by the wind on Lake Erie, than by any other cause. The Niagara river, one of the shortest, but one of the most famous rivers in the world, is a part of the system by which the waters of the Great Lakes are carried to the ocean. Its entire length is only 36 miles—22 miles from Lake Erie to the Falls, and 14 miles from the Falls to Lake Ontario. The Niagara river is merely one link in the chain which conducts the waters of Lake Superior to the Atlantic. It is called the Niagara river between the two lakes, Eric and Ontario. When it leaves Lake Ontario, it is the River St. Lawrence, which is 700 miles long, and falls into the Gulf of St. Lawrence. It is part of the boundary line between the United States and Canada, so decreed by the treaty of Ghent, in 1815. By that treaty, the boundary line runs through the centre of the Great Lakes, and through the deepest channels of the rivers. By this means, over three-fourths of the islands in the river, including all the important ones but one, belong to the United States. Of these islands, there are in all 36, of which Grand Island is the largest, and Goat Island the most famous. In its course, the river falls 336 feet, as follows: From Lake Erie to the Rapids above the Falls, 15 feet; in the Rapids, 55 feet; at the Falls, 161 feet; from the Falls to Lewiston, 98 feet; from Lewiston to Lake Ontario, 7 feet. Its sources are: Lake Superior, the largest body of fresh water in the world, 355 miles long, 160 miles wide, 1,030 feet deep; Lake Huron, 260 miles long, 100 miles wide, 1,000 feet deep; Lake Michigan, 320 miles long, 70 miles wide, 1,000 feet deep; Lake St. Clair, 49 miles long, 15 miles wide, 20 feet deep; Lake Erie, 290 miles long, 65 miles wide, 84 feet deep. Several smaller lakes, with one hundred rivers, large and small, pour their waters this way, draining a country of more than one hundred and fifty thousand square miles. This is the drainage of almost half a continent, and whose remotest springs are 2,000 miles from the ocean. With such a supply, it is not surprising that the volume of the Niagara river is never noticeably diminished. Through the mouth of the St. Lawrence, more fresh water pours into the ocean than through the mouth, probably, of any one river in the world. The river, over the American Fall, falls 159 feet, and over the Canadian, 165, the difference being caused by the greater accumulation of rock at the base of the former. The Niagara is never frozen over, but it accumulates more ice than any other river in the world. From records kept, a rise in height of water of one foot at top of Falls will, by actual measurement, raise it 17.5 feet below. The river, within four or five miles of the Falls, contains some of the best fishing grounds to be found anywhere. On the surface below the Falls, the current, when the water is smooth, runs on an average about 6 or 7 miles per hour. Sailors say, about 30 or 40 feet deep, it runs at least 10 or 12 knots. And this is the reason, we think, why saw-logs and other bodies plunging over the Horseshoe Fall are not seen until they come up at the Whirlpool, a distance of 3 miles. 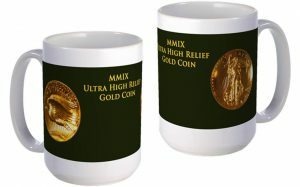 There is a tradition that there is a periodical rise and fall in the level of the Lakes, embracing a period of 14 years. In 1843, 1857 and 1871 the Niagara river was very low. March 29, 1843, a heavy gale from the west caused the highest water ever known. The water rose 6 feet perpendicularly on the Rapids. On March 29, 1848, a strong east wind drove the water back into Lake Erie. The heavy ice was wedged in at the mouth of the river. This dammed the water up, and soon the river was nearly dry. The rocks under the Rapids were bare, and people walked and drove over them. The Falls, of course, shrank to a mere nothing. The next morning, the ice was forced out, and Niagara resumed its sway, but the sights and the experiences of that day were novel ones. The average depth of the river from Lake Erie to the Falls is about 20 feet. In some places it is over 2 miles wide. At the narrowest point, near the Whirlpool, the current is above 40 miles per hour, and at the widest part, about 4 miles per hour. Between the Falls and the Whirlpool, the depth varies from 75 to 200 feet. At the Whirlpool Rapids, it is estimated at 250 feet; in the Whirlpool, at 400. But it should be recalled that this is the depth of the water alone. The mass of stone, gravel, shale, etc, which in one way and another has been carried into the channel, lies below the water and above the original bottom of the Gorge, which, therefore, is probably as deep again. Various estimates have been given of the amount of water going over the Falls. A point 300 feet wide below the Falls being selected, the depth estimated, and the velocity of the current known, it was estimated that 1,500,000,000 cubic feet passed that point every minute. Another estimate says that 100,000,000 tons pass through the Whirlpool every hour. Judge DeVeaux estimated that 5,000,000,000 barrels go over every 24 hours; 211,836,853 barrels an hour; 3,536,614 barrels a minute; 58,343 barrels each second. 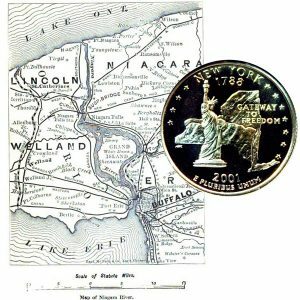 The New York State Quarter Coin shows with a map of the area including the lakes, rivers and falls between Canada and the United States.